Our stylish printed vertical blinds can be easily adjusted to allow just the required amount of light into the room, and are suitable for most types of window, but especially for large windows and patio doors. They can be tilted to allow a little light to filter through, or pulled back completely to open up the whole window. 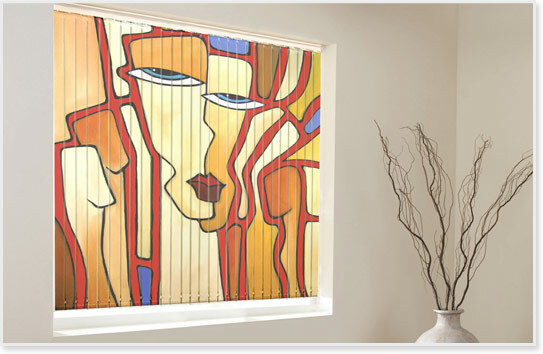 Our Vertical blinds can be printed using an image from our Gallery or you can choose a Photo blind, using your own photograph. Both options are available in regular and blackout fabrics. A Vertical blind printed on both sides with the image of your choice can act as a great room divider - a brilliant and innovative way to make a real feature, and fabulous in loft rooms and apartments. We can also offer printed Vertical blinds for bay windows using curved headrails. Please contact us for further information.